fitting – "da Trooper Bali"
Seventeen weeks, 29 March 2014. I have no chance to visit the workshop to an eye watching the progress since I am away from the town. After I am back from Yogyakara for the job task journey and landed in Bali on 24 of March 2014 and on Monday I have to go to the office for a duty, therefore I have no time to see may babe for two weeks. 21st weeks, 12 April 2014. As usual, after office hours on Saturday by 2 pm, I driving my vehicle home, but before home I will go to the workshop to inspect the development of the project. I hope there is a lot of progress on my da Trooper. But un fortunately because of the traffic jam, I could not reach the workshop during the office hours and just arrived after 7 pm, where the workshop is closed and the technician are home already. So I only can check and review some progress. like the new Grill is in progress and the work just fitting the face of the grill, while the house of sign on lamp still not make up. Just a form of the position of the headlamp is made. So I am back home with a slight disappointed. Two weeks only making the headlight form, which in my opinion should be more work are fixing. I am visit the workshop to see the last progress of the project and to check if there is some new ideas coming. 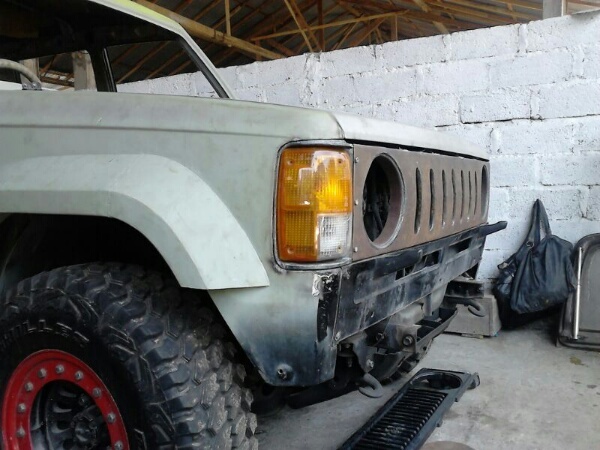 I am happy that the progress quiet much as seem all of the physic welded are finish and the work start to hamper the surfaces of the body and some of them already applied with putty to close the damage surface. Now start to apply putty to make the surface of the body smooth and fair. It will take about two week and after all the surface are fine, will spry by foxy and generaly check the condition of the surface to make sure all the points of the surface are really fine. Mr. Dodi is the man who will take care of the work. He explain to me that could be the next week will apply the putty again and after all part are applied with putty will smoothing with papersand for approximately for time than will spraying the primary black paint, he said after this part, the work will continue to rubbed smooth with sand paper no. 2000 and after that will check again to all of the surface to make sure that not any point of the surface are damage. 23rd weeks 26 April 2014. 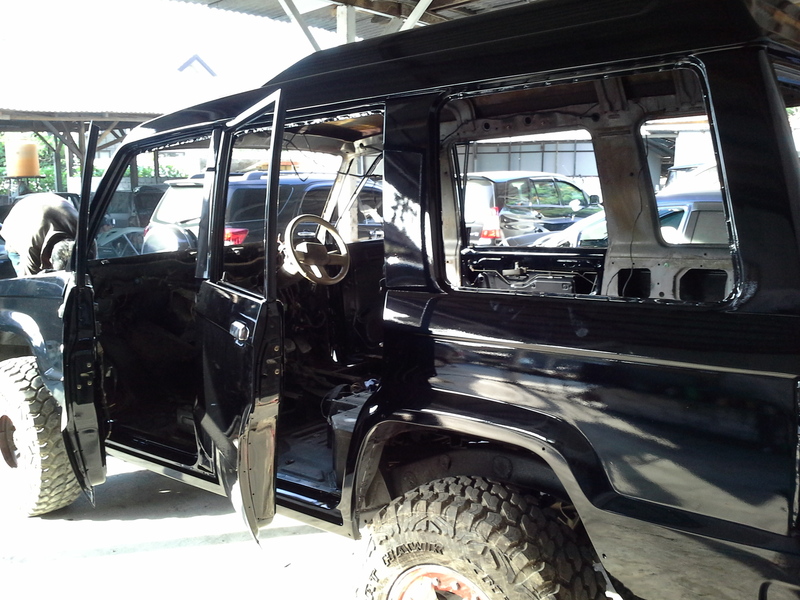 I am came to the workshop to have a look the progress and found that Mr. Dodi who handle my Trooper is not in duty since he went to his home town which is in South Malang, East java due to a family matter. So I meet my black trooper and found that it is now have been applied by a primary black paint and in some part seem just rubbed again due to there is a small spot seem occur on it. Then I left the workshop after have a look. I came again at 15.45 Bali time to the workshop and found that Mr. Dodi is still work rubbing the roof and inform me that there is some spot of the putty in the surface and must rubbed to make it smooth. He work and watering the surface while rubbing it.